Construction of post-tensioned slabs on grade is very similar to using reinforcing steel, except for the tensioning step. 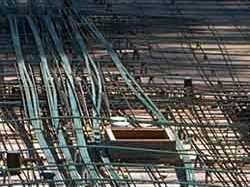 Cables are arranged as indicated by the engineer and chaired to run through the center of the slab. For residential construction, tendons at 48 inches on center are common. Commercial foundations will have much more steel. Tendons can be easily routed around obstructions. Tendons today are seven high-strength steel wires wound together and placed inside a plastic duct. At each end a PT anchor is located and these are located in pockets embedded into the slab edge. When the strands are stressed, the wires will stretch—about 4 inches for a 50 foot strand—to apply 33,000 pounds of load. Stressing should only be done by qualified workers. After stressing, the tendon is cut off and the pocket in which the anchors are located is filled with grout to protect them from corrosion. Larger structural concrete members may also be post-tensioned, especially in bridges and floors and beams in parking structures. 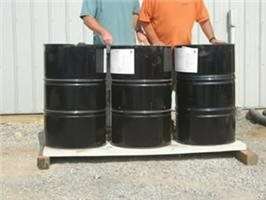 The process is very similar to that used for slabs, except on a bigger scale. One interesting difference is that the tendons will often be "draped" so that they are low at the midpoint of a beam and high at the supports—this places the steel at the point of highest tension where it can keep the concrete held together tightly. 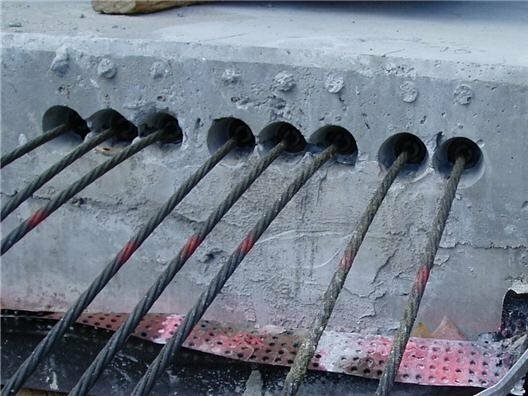 With structural members the duct is often grouted full following stressing to bond the strand to the concrete along its entire length—these are called bonded tendons. Unbonded tendons, used in residential slabs, remain free to move within the duct and are protected from corrosion by grease. PT tendon placement and stressing is usually done by companies with certified workers who specialize in this work. Since PT is simply reinforcement, there really aren't any specific decorative applications related to post tensioning. The advantages of PT as noted in the opening page are the lack of cracking (or at least very narrow cracks) and the ability to span farther. PT slabs on ground can be placed and stamped just like with any other concrete slab. Surfaces can be stained or overlaid. 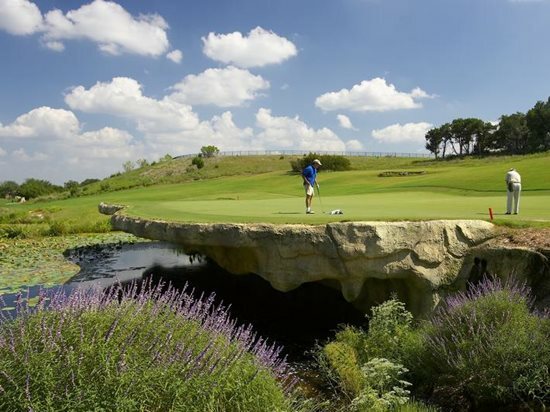 The only concern is to always remember not to cut or drill into post-tensioned concrete slabs, since once a tendon has been cut, it is very difficult to repair. Many post-tensioned slabs will be stamped to alert the owner and any renovation contractors that the slab is post tensioned. A post-tensioned countertop can support a lot of weight. Manufacturing is certified for Unbonded Single Strand Tendon Fabrication Facilities (about 95% of U.S. production is certified under this program) and Prestressed Concrete Strand manufacturing (this is afairly new program--only 6 plants are certified, all in China). 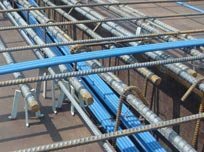 Individuals must first be certified as Level 1 (fundamentals), then can go for Level 2 (either as an inspector or as an ironworker for bonded post tensioning installation). A new certification for slab-on-ground installer/stressor is in the planning stages. More information on PTI certification programs. Ironworkers Union: Developed by Jim Rogers at Evaluation and Certification Services (publishers of Post Tension Magazine), this program offers two programs, to certify installers of single strand unbonded post-tensioning installers and bonded post-tensioning installers. Rogers says they conducted over 2000 exams in 2007 and are ahead of that pace in 2008.